Episode II: The Wrap Up. Maybe organizing my life in episodes would be easier, or at least easier for you all to follow along. Lets give it a try. This one is called episode II because it’s the second major trip of the year, the first being Spain and South Africa. This one bring us to Victoria, Los Angeles, and San Fran. If you missed my “Thoughts from the Road” post then maybe start there. Otherwise you’ll miss 75% of the racing action. Naturally I’ll do this out of chronological order just to confuse everyone. 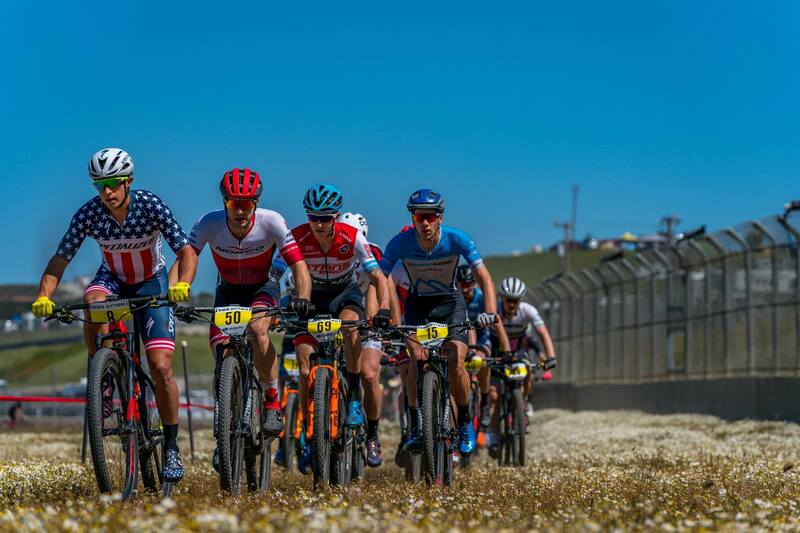 Sea Otter Classic is North America’s biggest bike festival (I think) and along with a ton of industry jazz comes some high caliber racing on a mediocre course. 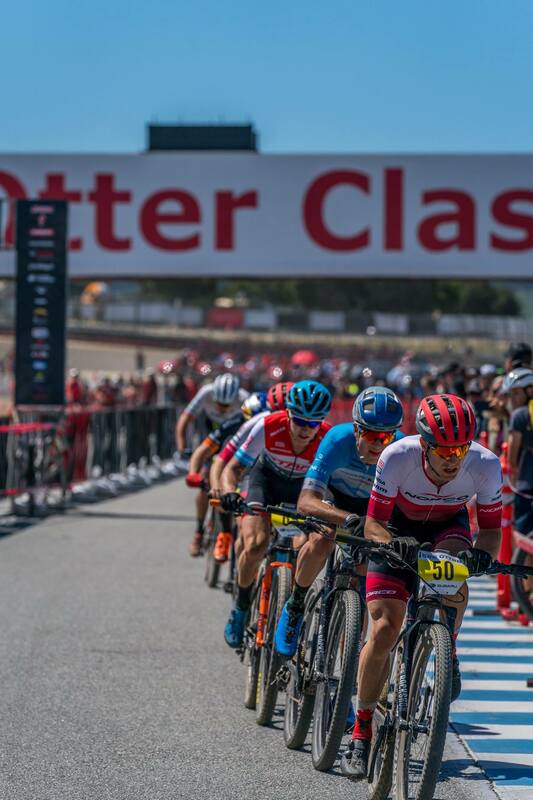 Sea Otter is held at Laguna Seca, the gnarly motorsport speedway with the corkscrew feature that flips supercars just east of Monterey, California. Massive expo setups line the infield and the track is used for road races, crits, mountain bike starts, short tracks, etc. 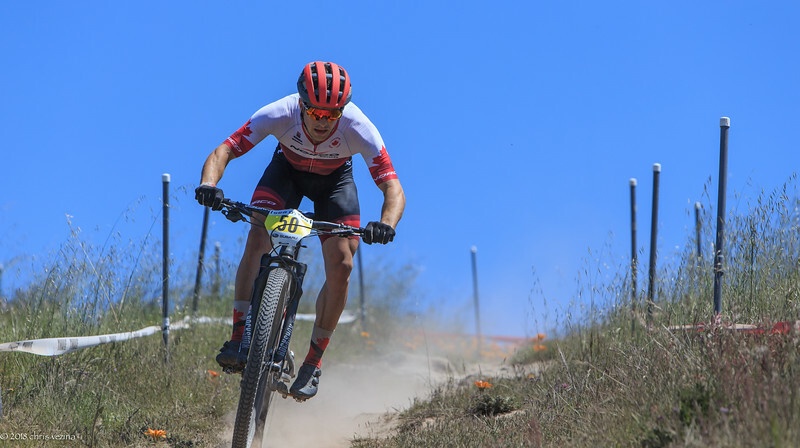 For Norco as a company this year, Sea Otter was particularly special because they just released the new DH bike, the Aurum HSP. I would love one of my own but apparently there’s a clause in my contract about taking excessive risks, and it’s safe to say that me on a downhill bike is an excessive risk. Nevertheless, check it out! 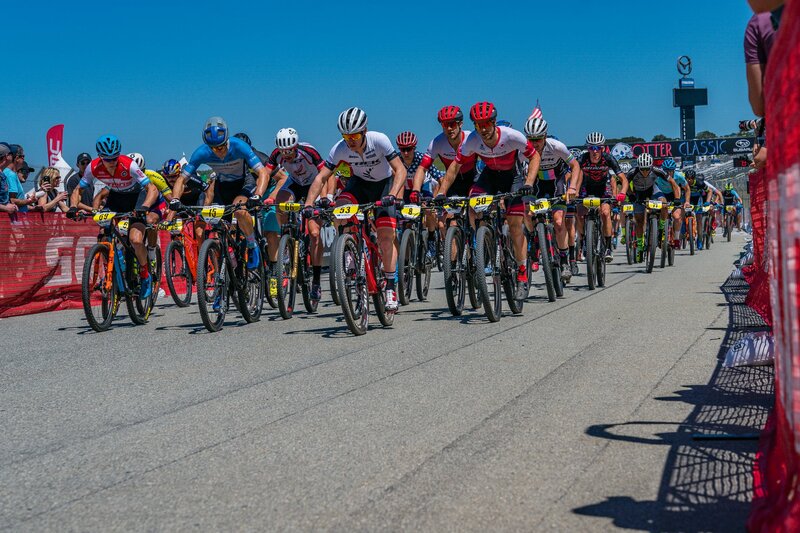 The racing at Sea Otter is quite high caliber, especially on the MTB side, but unfortunately, I can’t say the same about the courses at Laguna Seca. Pre-ride yielded a primarily grass course with an uphill sand pit beside the racetrack, limited technical features, vertical climbs, and new this year: zero single-track! Although I haven’t exactly given this course rave review so far, there are some positives worth mentioning. 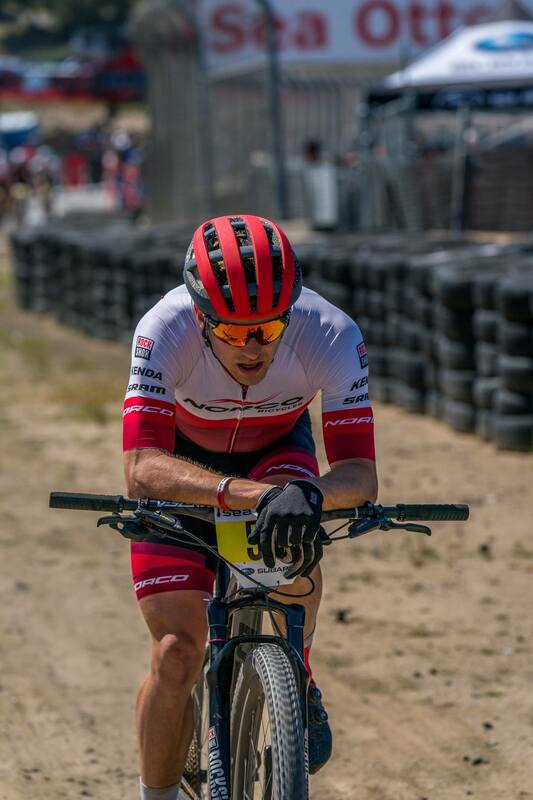 Racing the courses at Sea Otter is so much fun. That open layout design in addition to the speed, pavement, and vertical descents into chicanes all make for some fun racing. Groups tend to form and pack racing is tactically more exciting. Just goes to show that that no matter how bad a course is, the racers will always make it fun. As for the racing itself, everything kicks off with the short track. The XCST has become a more important event this year with it’s addition into the UCI World Cup calendar. So everyone takes them a little more seriously now. The action packed racing of approximately 20-30 minutes takes place on a short track (hence the name) with lots of tactical opportunities available. It is a game of positioning, power, efficiency, and ruthlessness. This year’s sport track was looking good for me. I was sitting comfortably in the front group, I had launched a few attacks to form a selection of the strongest riders and had even broken away for a lap (by accident). The uphill sand pit was in the race, making things challenging and positioning important. Approaching the final two laps I started to feel good and was ready to put in a good dig. My thoughts were to follow the wheels and conserve until the last decisive moment, an open grass hill, and then really put some power down. All was going to plan until Sean Fincham, Quinton Disera and myself all got tangled up in the sand pit. We had to get off and run after dabbing, so we lost the front group. A little peeved, I turned to the boys and said “hold on” before laying down a scorcher of a last lap. Fast enough that I put Quinton back in contact with the front group and he managed 7th. Coming from a dozen or so seconds back from the lead after getting out of the sand, I was happy with the outcome of that effort. The XCO race proved to be mildly aggravating for me even though I ended up very pleased with the outcome. The race starts on the track and goes 30 riders wide until the first steep climb when everyone goes bananas for positioning and the selection is made. Previously, I always miss the selection and then chase for half the race. This year was no different, and in all honesty, don’t know exactly what happened. I think I got boxed in a bit while I was still in a reasonable position and I ended up missed the front group. So I chased with heavy horsepower on the flats and whatever I could manage on the climbs. It was all about keeping average speed up as the race was 8 laps total and we were running 10-11 minute laps. I was about 30-40 seconds off the front group after the first lap and it took me 4 laps of solo chasing to make contact. Once I made contact, it took me another lap to get out of the hurt locker and finally breathe again. Not bitter, I just want to make that front group next year. The remainder of the race was a tactical ‘who’s got what’ race. I was trying to feel everyone out in the group to figure out how this was going to stack up. Sergio of Trek Factory Racing, was getting dropped on some climbs, but I knew he had some last lap jets in him. Andrew L’esperance had been riding very strongly during this campaign and he was a definite contender. Sean Fincham rounded out our group and was surprising me with the tempo he was setting. 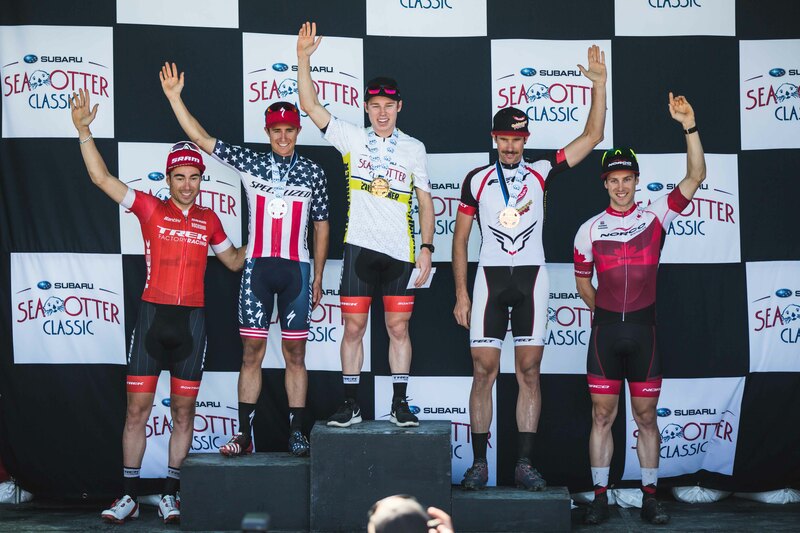 In all honesty I wasn’t sure how it was going to line up, but it was important to fight because only a group of 3 was ahead of us and Sea Otter podiums go 5 deep. So that meant 2 out of the 4 in our group was going to get on. Ohhhh buddy. Fireworks went off on the final lap as expected. First Sean attacked, then Sergio responded but crashed, then Andrew took control, Sergio went again, and I finally got to put a dig in to chase it all down. I managed to get around Andrew and close the gap a bit to Sergio but couldn’t quite obtain that 4th place spot. 5th on the day is still better than I was expecting. Upon arriving to Monterey it’s always important to go for a ride after a 17 mile drive. This beautiful road boasts some real estate I will likely never be able to afford, but the views are fantastic. Other fun facts: riding the road is free but driving it requires a fee, and take it from me, it’s important to dress warmly down by the water. 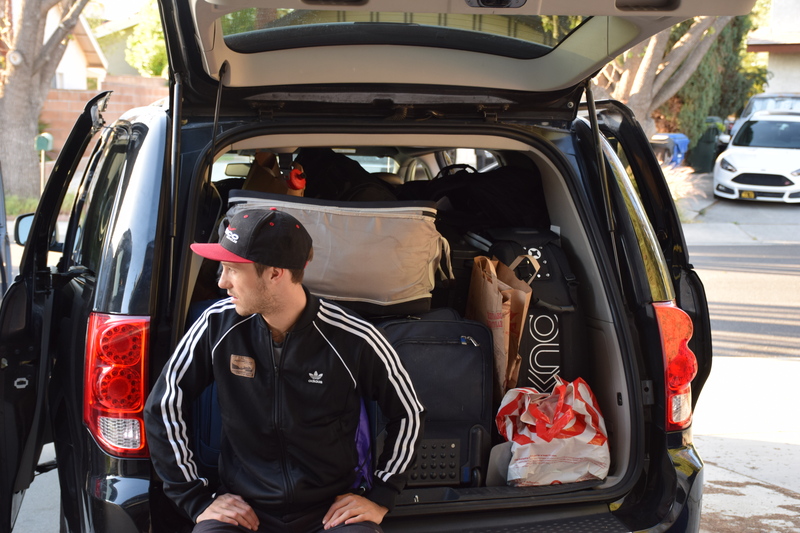 Last point to address is the Dodge Grand Caravan and the question of “how many bikes can you fit?” The answer depends on how many people in the car. 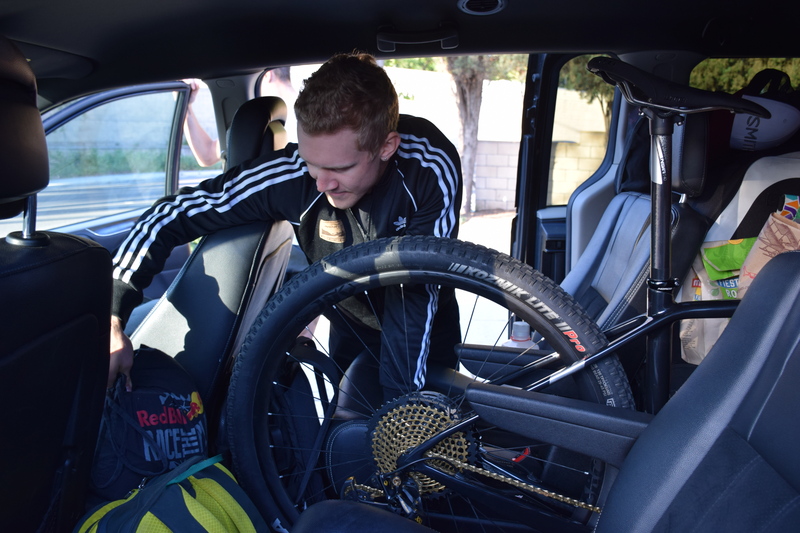 For example, between Fontana and Bonelli, Andrew drove the van to the new accommodations while Sean, Quinton and myself had to ride because we had 8 bikes between the lot of us. So the answer is: 5 bikes, 8 bike bags, 4 large luggage bags, 1 cooler, 6 backpacks, 4 carry-on bags, 1 human and 3 shopping bags full of food. There was even room left over. Pro tip: If you have stow-n-go (the fold away seats) when your seats are in the upright position, load to compartment that would normally house the seat with stuff like tires, shoes, and helmets. We then like to refer to that storage area as the ‘Boarder Crossing’ secret compartment. Finally, be sure to load heavy stuff down there so the center of gravity is lower and you can still rally the minivan.